June 20, 2015 – NASA is getting ready for a series of tests that will check out Orion’s service module, a critical part of the spacecraft that will launch atop the agency’s Space Launch System (SLS) rocket on future missions to an asteroid and Mars. 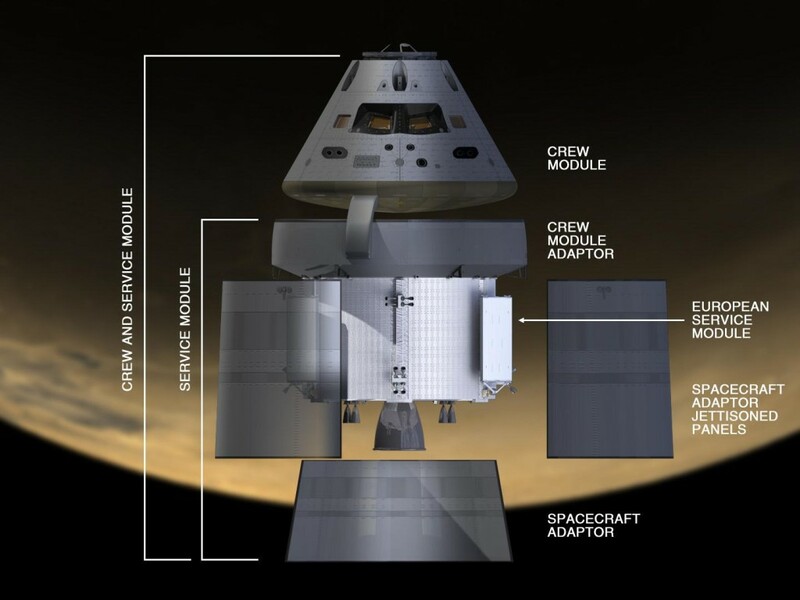 The testing, which will take place at NASA Glenn’s Plum Brook Station in Sandusky, Ohio, will begin with the arrival of a crew module adapter simulator in late June and a test version of Orion’s ESA (European Space Agency)-provided service module in the fall. The service module development and manufacturing work being done by Europe builds upon NASA’s many years of cooperation with the Paris-based ESA for the International Space Station. The agreement for the service module for Exploration Mission-1 (EM-1) maps out a plan for ESA to fulfill its share of operational costs and supporting services for the space station, and deepens international cooperation as Orion explores deep space destinations. The cylindrical service module is made of an aluminum lithium alloy and is approximately 13 feet in height and about 16.5 feet in diameter. Once deployed, the solar arrays will span about 62 feet. It is being built and developed by ESA’s industrial partner, AirbusDS of Bremen, Germany. The ESA-provided element brings together new technology and lightweight materials while also taking advantage of spaceflight-proven hardware. For example, ESA is modeling several key components — like the solar arrays — from technology developed for its Automated Transfer Vehicle-series of cargo vessels, which delivered thousands of pounds of supplies to the space station during five missions between 2008 and 2015. NASA is providing ESA one of the Orbital Maneuvering System (OMS) pods that allowed space shuttles to move in space to be upgraded and integrated into the service module. The OMS engine that will fly on EM-1 had previously flown on nineteen space shuttle missions and performed eighty-nine burns. To round out the service module, Lockheed Martin, NASA’s prime contractor for Orion, is building a crew module adapter that connects the ESA-provided component to the Orion crew module, three fairing panels that protect the module during ascent to space and a second adapter that connects the service module to the SLS rocket. Beginning this summer, engineers will use a “building block” approach to testing in which they will evaluate each piece as the elements composing the service module are stacked atop each other to validate the module before flight hardware for EM-1 begins arriving in 2017. In late June, a test version of the crew module adapter being built by Lockheed Martin at NASA’s Kennedy Space Center in Florida will arrive in Ohio for testing, followed by a structural representation of the ESA service module in October. Both will be tested at Plum Brook’s Space Power Facility that can simulate launch and ascent acoustics and mechanical vibrations. There, technicians will use a large vibration table to mimic the shaking the service module will experience when SLS boosts Orion into space and then test how it endures vibration from the noise it will experience during the rocket’s powerful liftoff. “We’re testing one piece at a time as we integrate the elements so we can look at our models, determine how the vehicle responded, adjust as required and perform additional tests if we need to,” said Kearns. The testing campaign at Plum Brook Station will continue for most of 2016. Once complete, the stacked structural test articles will be sent to Lockheed Martin’s facility in Sunnyvale, California, where hardware and software simulating other parts of Orion will be integrated before undergoing additional structural tests. All this testing on structural representations allows engineers to make sure flight hardware is properly built and will perform to NASA’s crew safety and flight requirements. The ESA-provided service module for flight will arrive in the U.S. in January of 2017 and be sent directly to NASA’s Kennedy Space Center in Florida for integration with the rest of the Orion spacecraft. The entire EM-1 spacecraft will then be shipped to Plum Brook Station for environmental testing that qualifies the vehicle for flight, and then returned to Kennedy for launch processing.